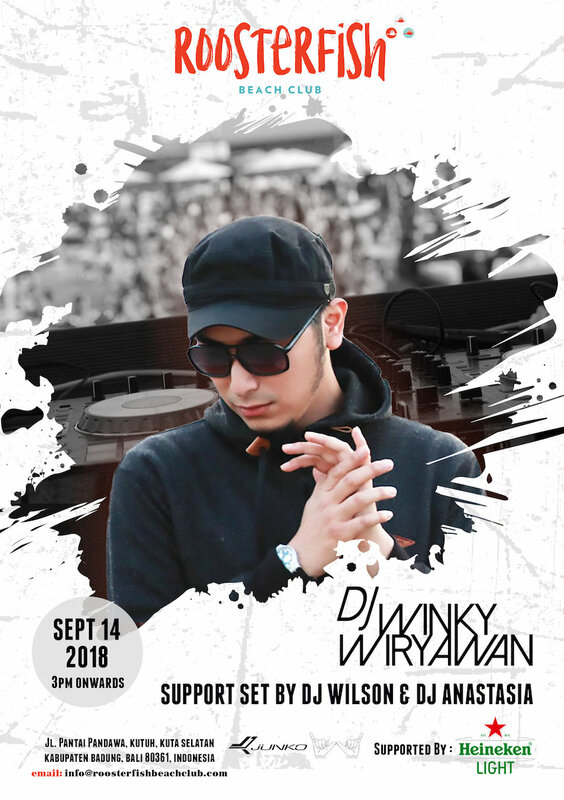 Roosterfish Beach Club invites you to enjoy the tunes of DJ Winky this Friday, 14 September 2018, and start the weekend early at the coolest beach club in Pandawa. Starting from 3pm onwards, Roosterfish Beach Club will welcome the likes of DJ Wilson and DJ Anastasia before the headlining DJ Winky hits the decks. Roosterfish is all about chilled cocktails, signature oversized drinks, big buckets of the island’s coldest beers and refreshing home-made juices to be enjoyed throughout the venue. It’s going to be all about music, drinks, sun and sand on Friday. On top of the drinks and entertainment, you can indulge in the beach clubs’ delectable menu of wood-fired pizza, seafood BBQ’s, fresh salads, hearty burgers, Balinese favourites and more. Join in the party and get a head start to a fun-filled weekend at Roosterfish Beach Club.